The story of Teresa Żarnower is one of creative passions and emotions, and of political and social involvement in the stormy first half of the 20th century. The exhibition discovers previously unknown aspects of the work and life of one of interwar Poland’s most radical visual artists. Teresa Żarnower was born in an assimilated Jewish family. During her artistic studies, she grew interested in avant-garde ideas, becoming fascinated with the uncompromising nature of radical art of Constructivist origin. She had contacts with communist working-class activists, standing, alongside her partner, Mieczysław Szczuka, firmly on the left side of the Polish political scene. The adolescent love she felt for Szczuka was cut short by his tragic death. At the end of 1937, Żarnower moved to France. In 1940, fleeing from war-torn Europe, she went from Paris to the south of France and then through Spain to Lisbon, where she spent fourteen months, trying to secure a US visa. Then she found herself in Montreal, Canada, where she spent the next seventeen months. She eventually reached New York City only in mid-1943. She found opportunities there for pursuing her artistic career, the famous Peggy Guggenheim Art of This Century gallery staging her solo exhibition. She also participated in the Jewish Museum’s inaugurating show. In the US, Żarnower created gouaches and drawings, disturbingly different from her earlier work, as well as the famous relief, The Uprising of the Warsaw Ghetto [Powstanie w ghetto warszawskiem]. Curated by Milada Ślizińska and Andrzej Turowski, the exhibition presents the effects of research and investigations through which an extensive – previously unknown or dispersed – documentation of the artist’s life and work has been gathered. 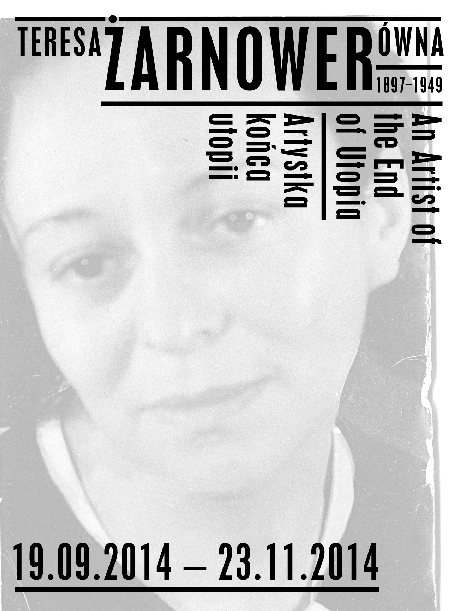 Żarnower’s art showcases in the context of the era’s formative events and of the work and views of the avant-garde art community Żarnower was part of. Andrzej Turowski had been studying those issues for years, publishing numerous fragmentary essays. Based on his studies, the exhibition will outline Żarnower’s liaisons with, firstly, the Polish Constructivist community, including Mieczysław Szczuka, as well as with pre-WWII leftwing politicians and activists (such as Jan Hempel). Also highlighted will be the artist’s contacts with Franciszka and Stefan Themerson, Józef Wittlin or Czesław Miłosz. Reproductions and archival materials will make the viewer familiar with some of lost or destroyed works, particularly from the interbellum period. The reconstruction of the final ten years of Teresa Żarnower’s life and artistic work required thorough research, initiated in 2009 by Milada Ślizińska, the originator of the Muzeum Sztuki exhibition. On display will be Żarnower’s selected works from the period, leased from the collections of Janet, Alex and Anna Luisa Abramowicz (New York), Richard Barth (New York), two London collections: Georges Dobry’s and Elizabeth Sobczynski’s, as well as from the collection of the Muzeum Sztuki in Łódź. The show will also feature documents from Polish, US, British and German archives. Embedded in the show is a partial reconstruction of Żarnower’s 1946 exhibit at New York’s Peggy Guggenheim Gallery, which was accompanied by a critical essay by Barnett Newman. The effects of the curators’ many years of work will be presented at the Muzeum Sztuki in Łodź, an institution devoted to exploring the legacy of the artistic avant-garde and one of few public institutions to hold Teresa Żarnower’s works in its collection. The exhibition is accompanied by a bilingual Polish-English monograph catalogue covering the artist’s life and oeuvre. One of its features is Andrzej Turowski’s essay on Żarnower’s art in the interwar period; Milada Ślizińska writes about the artist’s life and work in her previously unknown stormy final decade. Two essays by Aleksandra Idzior discuss crucial WWII-era photomontage series, devoted, respectively, to the defence of Warsaw and the Canadian war effort, while Magdalena Dąbrowski describes Teresa Żarnower’s work in the context of the 1940s New York avant-garde. The publication will also feature a chronology of the artist’s life and work, compiled by Agnieszka Szewczyk and Milada Ślizińska, a full catalogue of her known works, documents and a bibliography edited by Andrzej Turowski, a description of archival materials by Milada Ślizińska, as well as reproductions of all available works. The exhibition was heralded by an international scholarly conference, Lost Avant-Garde. Teresa Żarnower and the Artistic Left, devoted to the artist’s work as well as issues of the interwar European avant-garde and postwar American avant-garde. Participants included: Adrian Anagnost (USA), Nuit Banai (USA), Stanisław Czekalski (POL), Deborah Frizzell (USA), Marcin Giżycki (USA/POL), Serge Guilbaut (CAN), Alyce Mahon (GBR), Tom Sandqvist (SWE), Przemysław Strożek (POL), Andrzej Szczerski (POL), Milada Ślizińska (POL). Conference curator: Marek Bartelik. Collaboration: Paweł Polit.